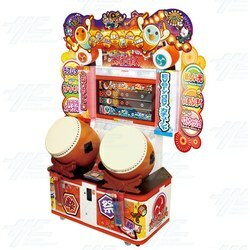 Taiko no Tatsujin 14 arcade machine is the l4th entry in Namco Bandai's drumming series contains a lineup of songs from j-pop to anime. The player uses a simulated taiko drum controller to play the notes of a chosen song's drum part as they are displayed on the screen. <b>Gameplay</b> Symbols moving horizontally along a timeline show the player what to hit and when. Blue symbols indicate that the drum should be hit on the rim. Red symbols indicate that the face of the drum should be hit. The drum can be hit on the left and/or right side. The symbols can be either large or small. Large symbols indicate that the drum should be struck on both sides simultaneously, and small symbols indicate that the drum should be hit on either side. A large blue symbol thus means that the left and right rim should be hit at the same time. In the Japanese version, subtitles under the symbols give the pronunciation of the sounds (for example, "do don do don") using a traditional system called kuchi shoga. While its appearance may seem cute, it is actually quite difficult: the player needs to accomplish at least 65% of the drum chart to pass, and the harder levels (hard and Oni mode) and modifiers (e.g. : hidden mode) will require much skill and chart recognization. Successful play builds up a life meter, and if the meter is past a certain point by the end of the song, the song is passed. Taiko no Tatsujin 14 arcade machine is the l4th entry in Namco Bandai's drumming series contains a lineup of songs from j-pop to anime. The player uses a simulated taiko drum controller to play the notes of a chosen song's drum part as they are displayed on the screen. Symbols moving horizontally along a timeline show the player what to hit and when. Blue symbols indicate that the drum should be hit on the rim. Red symbols indicate that the face of the drum should be hit. The drum can be hit on the left and/or right side. The symbols can be either large or small. Large symbols indicate that the drum should be struck on both sides simultaneously, and small symbols indicate that the drum should be hit on either side. A large blue symbol thus means that the left and right rim should be hit at the same time. In the Japanese version, subtitles under the symbols give the pronunciation of the sounds (for example, "do don do don") using a traditional system called kuchi shoga. While its appearance may seem cute, it is actually quite difficult: the player needs to accomplish at least 65% of the drum chart to pass, and the harder levels (hard and Oni mode) and modifiers (e.g. : hidden mode) will require much skill and chart recognization. Successful play builds up a life meter, and if the meter is past a certain point by the end of the song, the song is passed.